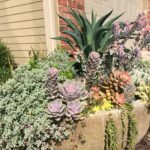 The propagation and spread of succulents in the garden world has really taken off. People creativity for using them has also left the run way. 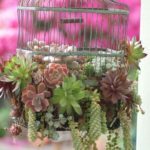 Most would see succulents as indoor arrangements, but there's a good section that are cold hardy as well. 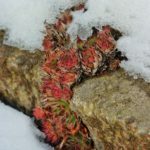 Sempervivum - say it with me - sem-per-vi-vum. That's right, Grandma's hen and chicks plants have several varieties range from the maroon, blue/green, lavender, lime green and even a rusty orange hue. 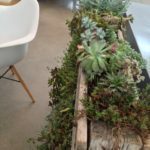 The second type of succulent is the well known sedum. 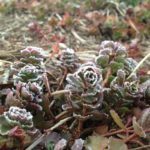 There are upright sedum and ground cover sedum, the later we will focus on here for design interest. 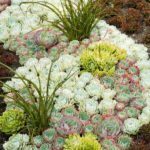 They have a larger variety of shapes than the sempervivum, with just as much color. They flower prolifically as a ground cover and have great fall color changes from chartruese to burgundys and blues. 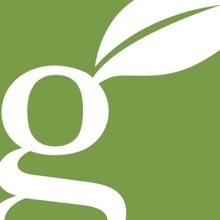 They are low maintenance with minimal water needs, and no pruning needed. 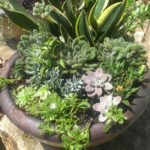 You can plant them in a pot, a bowl, in a rock wall, along stone steps or just in the garden bed. 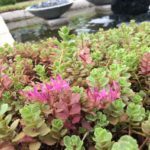 The slowly spread and can be easily propagated. They even bloom! What's not to like. Out doors they need the same as in doors, well drained soil (often gravely sandy mixes help) direct sunlight (more than 6 hours a day)with winter temps no lower than -20/30 F. Most importantly - don't over water them or plant them in a spot where water will pool or not evaporate off of them quickly. 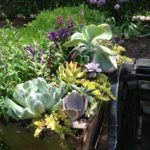 So next time you pass a garden center, check for their sempervivum or sedum and find your own way of incorporating these beauties into your landscape.